IBA’s resourcing as a corporate Commonwealth entity is managed through the Commonwealth portfolio budget statements and portfolio additional estimates statements process under the Prime Minister and Cabinet portfolio. The budgeted financial statements are approved by the Board and incorporated in the portfolio budget statements. Most of IBA’s consolidated operations are funded by self-generated revenue from home and business loan interest and investments. IBA receives funding from the Australian Government to assist with the operations of the business and home ownership programs. 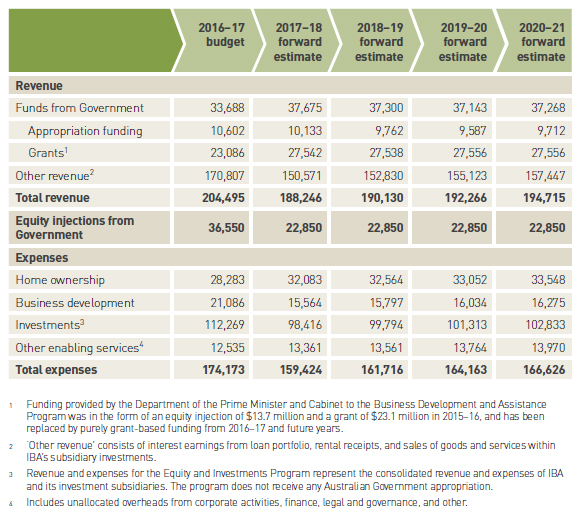 Operation of the business program is funded under a contract arrangement within the Indigenous Advancement Strategy through the Prime Minister and Cabinet portfolio. The funds for IBA’s investments (including all operating expenses) are generated solely from overall returns on IBA’s investment portfolio and are not appropriated from the government. Details of IBA’s revenue and expenses are provided in Table 1.